Chinese money – super or not? While Australia's politicians have been ducking and weaving in Parliament over Chinese donations, two business institutions have outlined quite different strategies for dealing with that other kind of Chinese money – investment. Breaking cover after its Asian retail banking cuts (and also notably during the political sparring), the ANZ Bank has sponsored no less than two reports on the value of Chinese investment (and trade) this week. And the industry superannuation fund peak group Industry Super Australia has made a left-field intervention into this debate by urging a more strategic government approach to managing foreign investment in agriculture. The ANZ reports (by Deloitte Access Economics and ITS Global) repeat familiar themes about Australia's need for foreign investment and how China is filling a gap, but is still small compared with the traditional giants (the US and Britain). But they do make important points about how Chinese investment has massively diversified since the original mining takeover binge by state-owned enterprise (SOE) investors, to the point where the typical investment is now a joint venture outside the resources sector in tourism or farming. This in effect lends some support to the Bob Carr and Merriden Varrall argument that there now are dozens of large, diverse and credible Chinese companies operating in Australia – but only a few, less substantial businessmen have been embroiled in the donations row. The full scope of ASIO's concern about Chinese financial influence peddling remains unclear. But there is a parallel in the way SOEs burst into the mining industry after 2007 (overpaying, grabbing outright control and upsetting local stakeholders) and the ostentatious way new Chinese donors have now burst into the political and university scene. The ANZ investment reports underline how Chinese investors have now learnt how to operate in Australia much more smoothly. How ASIO views this more substantial development from a national security perspective, compared with the unsubtle work of a couple of blatant attention seekers, would be interesting to know. The Industry Super Australia (ISA) study is an attempt to grapple with a key issue in economic diplomacy – why Australian investors have been largely unwilling to invest in processing of raw farm produce to capture more export value and extend the Australian brand into emerging middle-class Asia. It represents something of a mea culpa from the $3 trillion superannuation industry, which only has a tiny amount of its assets invested in agriculture and food. Indeed, the ANZ reports make this very point in defence of turning to willing Chinese investors to fund long-needed modernisation and recapitalisation of rural Australia. Industry Super argues that agriculture is now strategically important to Australia because of Asia's rising food demand and thus requires a more interventionist government approach to ensure more control and value remains in the country. 'This entails more effective monitoring, oversight, public reporting and evaluation of foreign investment in agricultural land holdings, farm businesses and agribusiness,' the study argues. A Labor-linked superannuation group finding some common ground with the national security establishment, and in territory normally occupied by the Nationals – now that's a unity ticket to look out for. It's little more than half a year since Donald Trump's victory in the US presidential election put a dose of salt through the ranks of free trade advocates over how they had lost control of the debate. Over at the Organisation for Economic Cooperation and Development, the latest Outlook ponders the contradiction of a rising public backlash against international trade, even though the pace of trade integration (or growth) has waned in the past decade. In research that certainly won't be news to voters in the Trump swing states in the old Democrat Party heartland, the OECD argues for a much greater focus on region-specific structural adjustment assistance policies. 'Measures helping regions to grow and workers to adjust to a new environment are the most likely to bear fruit,' the agency argues about spreading the benefits of trade liberalisation. 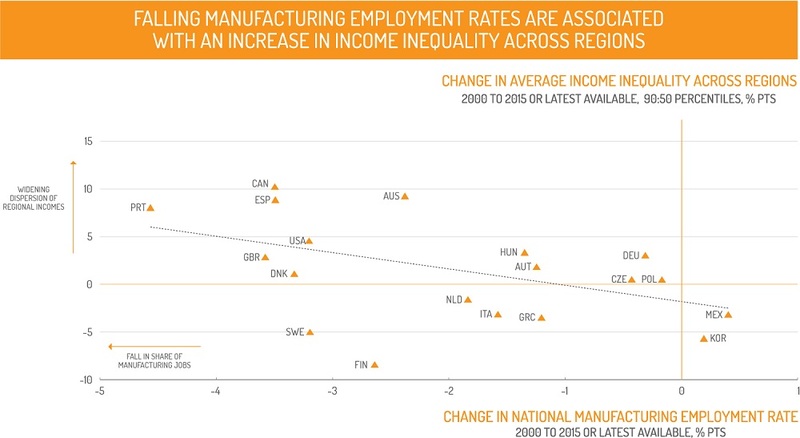 And there's an interesting chart in this analysis which suggests Australia has had a large rise in regional inequality by international standards, despite only being middle of the pack in terms of manufacturing job losses. Nevertheless, it comes as no surprise that the OECD research finds that trade liberalisation has played a lesser role in job losses than technological change or the rising amount of consumption now going to services rather than goods. The World Bank also reflects this same high-level focus on retraining programs to defend globalisation, though it reiterates (as does the International Monetary Fund) that new protectionism has not been the key cause of slower world trade growth. And the Bank's Global Economic Prospects report makes a new contribution to the search for the slowdown culprit by suggesting that multinationals which run in-house global supply chains may play a greater role in maintaining trade growth than global firms that rely more on arms-length trade. This thesis suggests vertically integrated global giants such as Samsung, Intel and Nokia may have been less vulnerable to trade slowdowns than traditional outsourcers like Apple, Motorola and Nike. And multinationals more generally have maintained global integration, while domestic firms have stepped back. But the Bank warns – with some relevance to Australia's multinational tax crackdown – that vertically integrated global companies might boost trade but they pose greater risks to national fiscal integrity due to transfer pricing. The quest for a Trans-Pacific Partnership (TPP) trade deal without the US has taken on the air of anticipation that greets a legs eleven call in bingo. But now at least there are some numbers to fuel the endeavour. The Canadawest Foundation's The Art of the Trade Deal study concedes that the Japan-led case for an eleven member TPP has largely been a diplomatic response to concern about the Trump Administration's shift away from multilateral economic policy. But it says the remaining eleven potential signatories would be better off moving ahead without the US than abandoning the project. They would boost their collective exports by 2.4% and their gross domestic product by 0.074%. These are miniscule numbers, but the original TPP macro growth numbers were always quite small, with the main game being the longer-term regulatory impact. But the study also identifies individual country impacts which might influence the path ahead. The remaining Americans (Canada, Mexico, Peru and Chile) do better because they don't lose their margin of preference into the US compared with others. In Asia, Japan and Vietnam see the biggest reduction in original gains, as they don't get into the US, but Singapore is better off because it maintains US access that other Asian counties don't get. But this study's bottom line is really strategic rather than economic, because it says the other members should stick together in a plurilateral club rather than allow themselves to be picked off by the Trump plan for selected bilateral negotiations. Yesterday at the Zhuhai Air Show, China's air force officially unveiled its worst-kept secret, the J-20 stealth fighter.